Although barely 65 kilometers of suburban sprawl separates Toronto from Hamilton, Ontario, the two cities have a rivalry that goes back to the 19th century. Torontonians look down at Hamilton, the gritty blue collar steel mill capital of Canada. Many Hamiltonians consider Torontonians big-city snobs and everyone loves to see the Toronto Argonauts lose when they face off against the Hamilton Tiger Cats of the Canadian Football League. Likewise, Hamilton’s Latvian community has been overshadowed by Toronto’s. 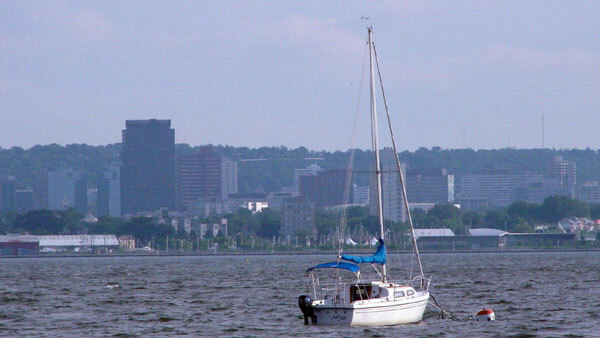 According to the 2006 Canadian census, Hamilton is home to 1,515 Canadians of Latvian descent. While Hamilton’s number pales against the 8,540 Latvians who call the Greater Toronto Area home, it ranks third behind Vancouver and is arguably the second most active Latvian community in Canada. The origins of Hamilton’s Latvian community are similar to those of so many others. Post World War II refugees arriving in Canada had to sign on as farm labourers, household servants, lumberjacks and hospital workers. Once their contracts were up, they migrated to big cities in search of jobs. Hamilton was experiencing a post-war boom and Latvian labourers easily found jobs in the city’s steel mills, electric factories and other industries. Soon afterwards the foundation of today’s Latvian community was laid. The Hamilton Latvian Society was formed in 1948 by 24 founding members led by Fricis Gulbis and Pēteris Ķikauka. A choir of 32 was up and running shortly and performed for the first time at that year’s Latvian Independence Day ceremonies. Its conductors have included componists Imants Sakss, Jānis Cīrulis and Viktors Rundāns as well as Janis Dindzāns, who established a kokle ensemble after moving to Hamilton in the early 1980s. The Hamilton Latvian School was also established in 1948 by Elza Gulbe. Attendance peaked in the late 1960s and early 1970s with more than 136 students. High school classes were offered for a time. Today the school is down to 22 students and is led by Baiba Bredovskis. The Hamilton branch of Daugavas Vanagi was founded in 1950. Over the years it has been the second largest and one of the most active chapters in Canada. The folk dance troupe Vainadziņš and the sport club Sparta have operated under the chapter’s umbrella since Day One. A key focus today is the support of former legionnaires, partisans, families with a large number of children, pensioners and orphans, the Lestene war memorial and Occupation Museum in Latvia. The current chairman is Edmunds Pulciņš. The first Latvian church services were held in Hamilton in 1949 by the Rev. Dean Alfrēds Skrodelis. Today’s Christ Latvian Ev. Lutheran Church traces its roots back to the early 1950s when pastoral care was provided by the Rev. Arturs Voitkus and the Rev. Pavasars. The Rev. Dean Ivars Gaide is the current pastor. He has been in that position for 20 years. The congregation owns a church in downtown Hamilton on Victoria Street. The facilities are also used by the Hamilton Latvian School and for other community functions. Other organizations include the Fisherman’s and Hunter’s Club, the Latvian Pensioners Society, the Venta 10th Guides and Aiviekste 39th Scout chapters, and the Hamilton Branch of the Toronto Latvian Credit Union. The youth organization Rota was active in the 1950s and 1960s. The Hamilton community has been blessed with a number of prominent Latvian figures. They include linguist and professor Pēteris Ķikauka, artist Tālivadis Ķikauka, componists Imants Sakss and Jānis Cīrulis, stained glass artist Gundars Robežgruntnieks, writers Jānis Klaviņš and Juris Zommers as well as medical practitioners Drs. Pēteris Vasariņš, Pāvuls Cakuls and Ieva Neimanis. The Hamilton area was also home to the literary journal Jaunā Gaita, edited for many years by Laimons Zandbergs. During the 1970s and 1980s Alfrēds Grīnbergs led Runči Trimda, a popular dance and rock ensemble that was in demand at Latvian social functions throughout Ontario and neighbouring states. One of its performers, Dzintars Cers, moved on to become a radio newscaster for the Canadian Broadcasting Corporation. Hamilton is also home to LaTV, headed up by Jānis Valdmanis and Niks Ozoliņš. Almost singlehandedly they have documented Latvian functions in the Hamilton and Toronto areas for more than 20 years. A vast collection of videos is available. Hamilton’s Latvian community joined in the drive for renewing Latvia’s independence. The community organized demonstrations on the anniversary of the Milotov-Ribbentrop Pact starting on Aug. 23, 1986, and running for five years until Latvia had rid itself of Soviet rule. Demonstrations and meetings with local politicians often were held with others from Hamilton’s strong Central and Eastern European communities. The size of the Hamilton community has ebbed with the demographics of the post-war immigrants and their baby boomer children. The community has shrunk and many offspring have moved away. At one point in the 1950s the Christ Latvian Ev.-Lutheran Church had more than 860 members. Now it is down to 322. In recent years the Hamilton Latvian Society has seen a revival under the leadership of its energetic chairman Arnolds Smiltnieks. The society boasts about 130 members and has been fueled by funds from volunteers working charity bingo games. 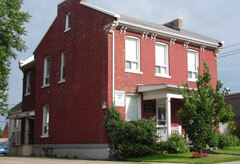 The society has renovated its house on Queen Street, donated by Vilis Rudzītis in 1958, with new exterior siding and interior finish. Monthly Latvian video nights run by the society have proved popular. The society hosted the Latvian National Cycling team during the 2003 Road World Cycling Championships in Hamilton. It has also sponsored Liepājas Metalurgs youth hockey teams at tournaments in the Hamilton area. Uncommonly for Latvian organizations, the society has donated money to local charities including the free lunch program at the nearby Christ Church Cathedral and local food drives as well as charities in Latvia that include the Sveķu special needs school, the library and school in Nīca south of Liepāja and the Occupation Museum in Rīga. Hamilton Latvians have always been frequent visitors to Sidrabene, a summer camp and cottage colony in nearby Burlington that hosts annual Midsummer festivities and runs children’s summer camps. It is owned by the St. Andrew’s Ev. Lutheran Latvian Congregation in Toronto but is actually closer to Hamilton than Toronto. The synergy between the Hamilton and Toronto Latvian communities is evident in the 13th Latvian Song Festival in Canada to be held in Hamilton from July 1-5. The Canadian festivals have been held in Toronto since inception in 1953. Spiralling costs in Toronto—and increasingly louder rumbling from centres like Hamilton, Ottawa and Montreal—finally resulted in a decision to move the festival out of Toronto. Nearby Hamilton was a good choice. What’s interesting is that the organizing committee includes members not just from Hamilton but also a number who live in Toronto or suburban cities to the west such as Mississauga, Oakville and Burlington, usually considered part of the Greater Toronto Area. Andrejs Buņķis of Toronto is the chair of the committee. Baiba Bredovskis, who headed the charge to get the festival to Hamilton, is vice president and responsible for events while Juris Ķeninš is vice president and responsible for music. Teacher and conductor Vizma Maksiņa is also handling music while Uldis Roze is looking after folk dancing. Juris Simsons, Astrīde Sīlis, Rita Sīlis and Aija Zichmane round out the organizing committee. The motto for the festival is “Dziedāsim, dancosim, Saules rakstus veidosim” (Let’s sing, let’s dance, let’s create sun signs). The festival is scheduled to kick off July 1 at Camp Sidrabene with a Sun Festival and celebration of July 1, Canada’s national holiday. Festival events will include the traditional choral concert and folk dancing extravaganza, an ecumenical service, a theatre performance, a choreographed folk dance competition, a concert featuring sacred music, Latvian folk music performances, festival balls, a meet-and-greet evening at the waterfront, art and crafts displays as well as a repertoire of Latvian films. Visitors are also reminded of nearby tourist sites: the Royal Botanical Gardens, Toronto and Niagara Falls (only 30 minutes away), as well as almost 20 world-class wineries in the Niagara-on-the-Lake area. Long under the shadow of nearby Toronto, the Song Festival will allow Hamilton Latvians to step out and be front and centre as they welcome visitors from near and far. I have just started viewing this site and am anxious to renew my Latvian connections. I have lived in rural Manitoba most of my life with little to do with other Latvians and at my stage in life, want to get more aquainted with our history and current gatherings. Plan on travelling to Latvia in the near future also. I will be in contact more often through the net and will strive to contact some of my parents friends. Sounds like a trip to Hamilton for one of the events should be in my plans. I live in the OH, USA., but enjoy reading about other cities/countries where there are Latvian centers. Hamilton sounds quite interest, so my daughter and I may have to pay the Latvian Center a visit and hope to make new aquaintenances! Hamilton was the home of Jaunbalss (1979–1985), an ensemble of young Latvians who were keen on singing not only the traditional Latvian repertoire, but also commissioned works by new Latvian composers, as well as exploring world choral music. The ensemble quickly became a Hamilton-Toronto choir, taking part in many Latvian events and several song festivals, giving annual concerts in Hamilton and Toronto, and guest concerts around Ontario and in Michigan and Québec.